I wait until the list of available plugins has built up. I check "Compare" and click "Install". "An update is available to plugin Manager. It is strongly recommended..." -> "Yes". "Installation Error: Installation of Plugin Manager failed." 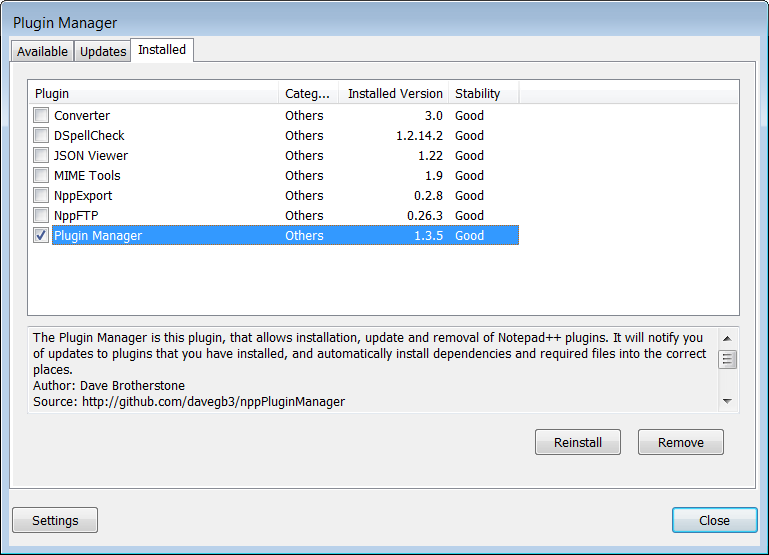 "An update is available to plugin Manager. It is strongly recommended..." -> "No". "Installation Error: Installation of Compare failed." What exactly am I doing wrong? How can I debug this problem? You can always find the latest release by going to https://github.com/bruderstein/nppPluginManager/releases/. Notepad++ will auto restart after prompt and the issue will be gone. Control panel -> Internet options -> Advanced Scroll down to Security. Make sure TLS 1.0, TLS 1.1, and TLS 1.2 are all checked. I just selected the "AutoSave" plugin as well. When I clicked "Install", it failed on AutoSave plugin installation, but Compare, being second, went through smoothly, and Compare plugin is usable now. So, unless you want to install the first plugin the list, this workaround is worth a try. I use the operating system win10 and my system type 64x. Anyway I installed to x64 notepadd++ from notepad++ website. But plugin manager has a trouble to install from "ProgramFiles".I removed at and I installed to 32-bit(x86).The trouble gone. My advice is you install notepad++(x86) if your system x64 (64-bit). Attempting to update the plugin manager, as detailed by other answers, did not resolve the issue for me and the "Installation of Compare failed" persisted. I was able to manually install the plugin, though. and copy the compiled artifacts into \Notepad++\plugins folder. Not the answer you're looking for? Browse other questions tagged installation notepad++ plugins or ask your own question. Why am I unable to install the NppExec plugin for Notepad++? How do I fix Notepad++ after attempting to add PoormansTSQLFormatter as a plugin? Is there a way to increase the recent files limit?